Check out what my team has been working on! “Our focus is really to help our members unlock the power of their networks through smarter and more productive conversations,” said Mark Hull, head of product for the LinkedIn messaging team, in a presentation. If a user is looking at a company where they’d like to work, LinkedIn’s messaging box will show that user a list of friends who work at the company whom they could connect with. If the user doesn’t know what to say initially, “we give them the words to say to help them with that conversation, just to kick things off,” Hull explained. 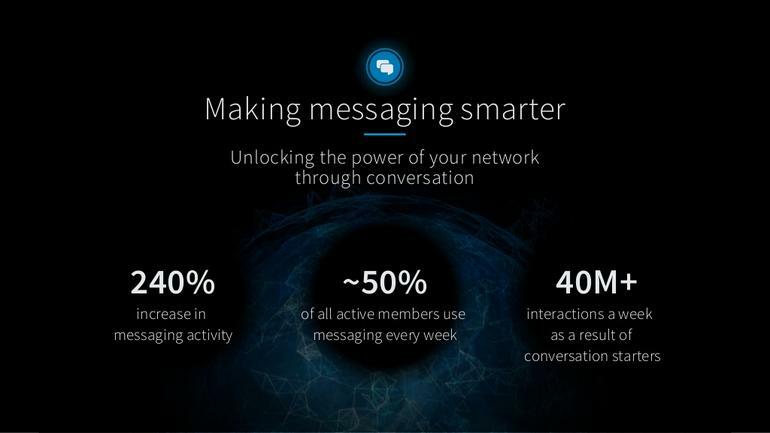 The smart messaging system would also add a link to the relevant job listing, giving more context to the conversation. Now that they’re in a conversation, these two friends can call up a bot to scan their Google calendars and find a time that works for both of them, without leaving the messaging box. LinkedIn will also look at where both parties have gone previously and suggest a location for the meeting.